Great force to run over the sea! 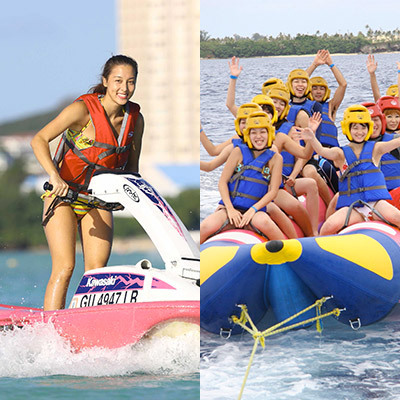 ABC’s banana boat is specially designed for Guam’s adventurous waters. 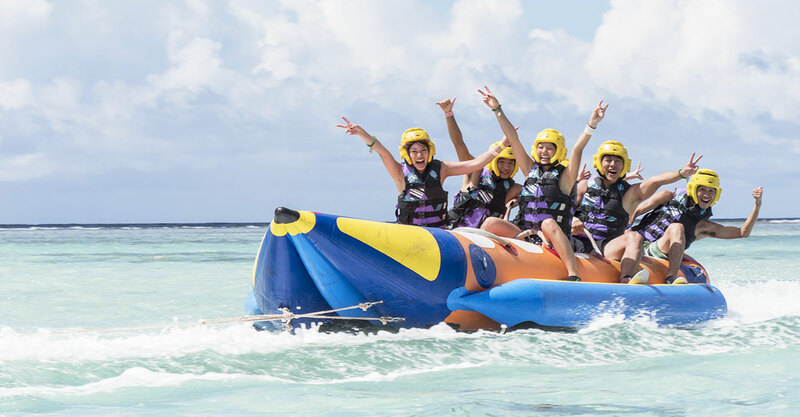 The twin-tube banana boat can safely seat up to six people, and it is able to zip through the Alupang Beach’s bay at a thrilling speed, ensuring its passengers a ride they will never forget! Experience a ride you will never forget on ABC’s banana boat! 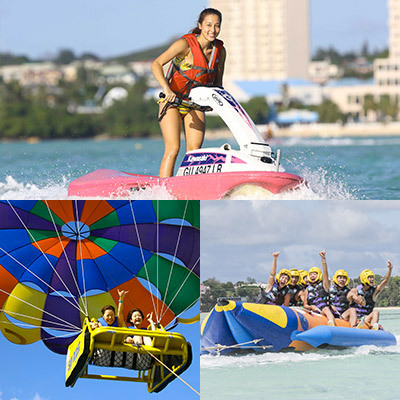 Zip across Guam’s beautiful waters at an exhilarating speed. 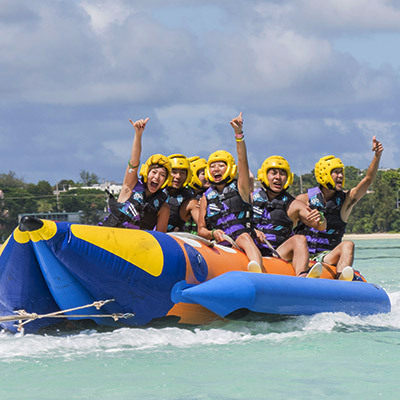 The Banana Boat that is offered on the Parasailing Boat will zip across Guam’s open oceans! Safety first! 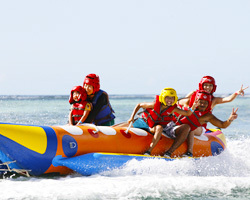 All banana boat passengers must wear life jackets, helmets, and beach shoes before proceeding with their ride. All equipment will be provided at ABC’s beachfront area. Straddle the Banana Boat, and grab the handle with both hands! The Kid’s Banana Boat tour is offered only at ABC’s beachside facility. Children ages 6 years of age and older may participate. 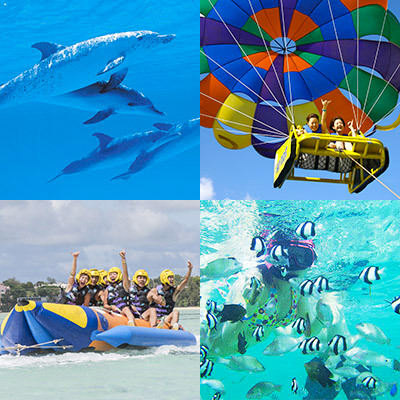 The awesome part of this tour is that you can also enjoy it with your family. Children ages 6-11 are able to ride the banana boat with the proper equipment such as life jackets, helmets, and beach shoes, which is provided at the beachfront area. Changes may be made in the state of the tide. Please confirm it on site. Participants who are 14 years of age or older can participate, but we only have good weather under the judgment of the staff. Participants who are pregnant can not participate (Super Beach Resort only available). Please do not participate in the case of alcoholic beast, heart, neck, back, shoulder, arms etc when injured. 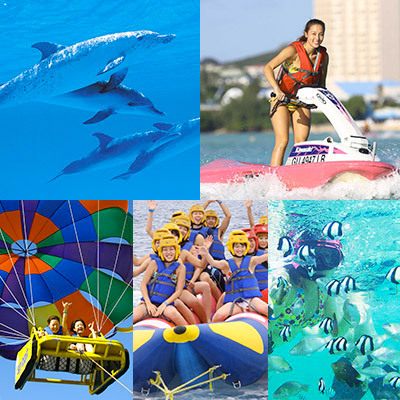 We also offer a great plan combining several main activities. All packages include transfer, lunch and super beach resort. 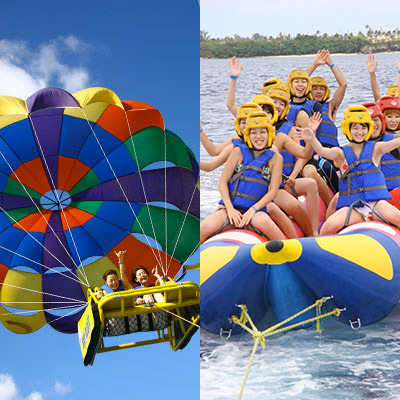 If you are purchasing parasailing and banana boat together, you may also enjoy the banana boat on the open ocean during your parasailing experience. Weather and time conditions may affect the banana boat experience on the open ocean, thus it may not be available on that day. But do not worry, ABC provides the Banana Boat experience in the bay or outside of the bay! Please ask one of our friendly staff on the day of the tour. Please meet at the Banana Boat Check in area 5 minutes before your scheduled tour. Please ensure that you are wearing a life jacket, helmet, and beach shoes before you proceed with the banana boat ride. All equipment is provided at the beach area. The ABC Beach Staff will assist you in boarding the banana boat. Enjoy the ride! The Banana Boat will be pulled by our jet ski with one of our experienced captains at the helm! After a thrilling banana boat ride, you will return to the beach front where you started. Please wear beach shoes that are provided free at ABC’s beach area. Feel free to come in your swimwear! If the banana boat ride is on the Parasailing tour, please follow the clothing instructions for each main activity. This activity requires use of both hands. Sunglasses, digital cameras, mobile phones, etc. can not be carried or used. Because it is designed with safety and stability in mind, it is rare that someone will be thrown off of the banana boat. Due to the physical nature of this activity, it is best to hold on tight for the duration of the ride with both hands. It is a 6-seater or 12-seater ride. The wearing of Life Jackets are a mandatory part of this activity. They will keep you afloat in the rare event of you falling into the water. Children between the ages of 6 and 13 may participate in the Kid’s Banana Boat tour which is only offered at ABC’s main beach area. If you are a parent or guardian, and you want to ride the banana boat with a child, this possible at ABC’s beachside only! Please ask any of our staff on the day of your tour.